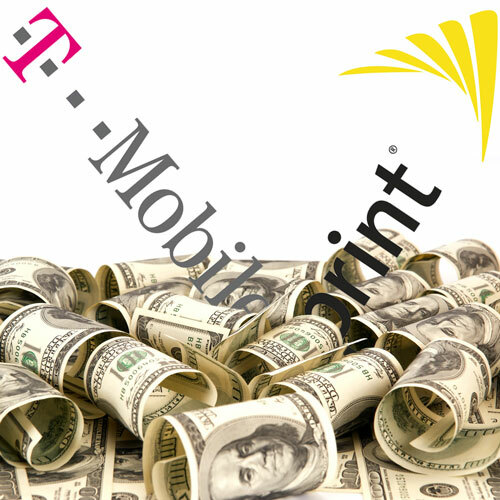 Sprint and T-Mobile are "zeroing in" on terms of a deal that would have Sprint—the 3rd largest wireless carrier in the U.S.—buy T-Mobile—the 4th largest carrier—for US$32 billion. According to The New York Times's DealBook column, the price has been more or less agreed to, but other aspects of the deal still have to be worked out, and it could be some time before it is announced. The move comes in the wake of regulatory bodies squelching AT&T's—the nation's second largest carrier—efforts to buy T-Mobile for $39 billion. At the same time, AT&T recently announced a deal to buy satellite TV provider DirecTV, while Verizon Wireless completed a deal to buy the parts of itself it didn't already own for $130 billion. In the face of such consolidation, Sprint and T-Mobile have struggled with being less than half the size of AT&T and Verizon, and that's only when you look at the wireless business, as neither of the smaller carriers offer the TV and landline services sported by Ma Bell and Big Red. Since regulators wouldn't let the big boys buy one of their little brothers, the only choice either Sprint or T-Mobile had was to buy each others. Since Sprint is slightly larger and owned by Japanese magnate Masayoshi Son's Softbank corporation, it's T-Mobile that's going to get bought. The question that first cropped up for me is what would happen to T-Mobile's "Uncarrier" model of allowing customers to buy subsidized devices without long-term contracts and allowing them to stop paying on the subsidy once their devices were paid for. T-Mobile has seen considerable success with its Uncarrier strategy, in part because it was a disruptive model that threatens the status quo in the U.S. wireless business. Masayoshi Son, or "Masa," has also expressed interest in disrupting the U.S. market, but it remains to be seen how he plans to do so. There are a couple of things to remember. The first is that this deal hasn't been announced, let alone filed with the Federal Trade Commission or any other regulatory body. Even if it is announced, there's no guarantee that it will get the green light, the #3 and #4 competitors in a market joining forces seldom gets much guff from U.S. regulators. If the deal doesn't go through, Sprint will reportedly pay T-Mobile $1 billion as a consolation prize. Image made with help by Shutterstock.